The Massoth DiMAX Reverse Loop Module ensures flawless operation in reversing-loops and Wye-junctions. The module can handle digital track currents of up to 15Amps without triggering a short-circuit. 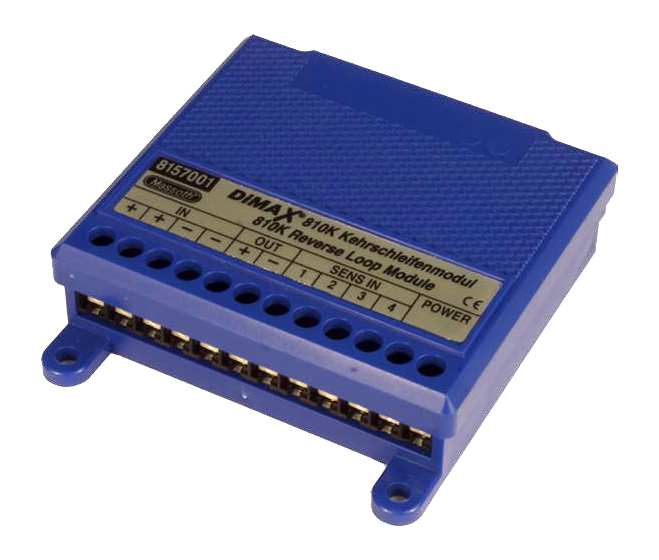 Currently available products for operating reversing-loops and Wye-junctions rely exclusively on short-circuit detection, the Massoth DiMAX Reverse Loop Module offers additional options as well. With the included sensor-tracks installed, the module operates without relying on short-circuit detection at all. The module detects the polarization of the entering train and adjusts the polarity of the reversing-loop section accordingly, before the train enters the loop. Track contacts (reed switches) may be used instead of the supplied sensor tracks; however, using track contacts requires the installation of a magnet under each locomotive. A mixed operation with sensor-tracks and short-circuit detection is also possible; short-circuit detection is switch on or off with a jumper inside the module. If a sensor track fails to work properly due to contamination or corrosion, short circuit-detection serves as backup. A reliable operation of the module is thus guaranteed at all times as two separate switching relays are utilized. The module will adjust to the correct polarization even if a train bridges a disconnecting point when the system is switched on. In this case the loop section of the layout will be powered up with a slight delay relative to the main section. With no sensor-tracks or track-contacts installed, the module operates effectively, relying exclusively on short-circuit detection. The module may also be used in analog mode; however, a separate power supply is required for the loop section. In analog mode, no train may bridge a disconnecting point when the system is switched on.